After seeing how to set up transport layer security for the Mosquitto MQTT broker by using the Transport layer security on this post, we need to see how to setup client authentication (only authorized clients can connect to the broker) either by using the common user/password based authentication method or using client certificates. The -c parameter is for creating the initial password file, if doesn’t exist, otherwise it will overwrite it!. For adding new users or update the passwords just run the command without the -c parameter. Using client certificates, signed by a certificate authority, assures the client identity. The certificate authority used must be the same used by the server certificates and is only supported over TLS/SSL. The require_certificate directive with the value true means that clients must now provide a client certificate to connect. The use_identity_as_username means that the user name of the connecting user is taken from the CN (Common Name) property of the certificate, otherwise we still need to provide an user and password. 1478537500: New connection from 127.0.0.1 on port 8883. 1478537500: Socket error on client , disconnecting. 1478537629: New connection from 127.0.0.1 on port 8883. 1478537629: Socket error on client , disconnecting. And we should have three files, two of them the user1.crt, the user certificate, and the user1.key, the user1 private key. 1478539830: New client connected from 127.0.0.1 as mosqpub/27159-pcortex (c1, k60, u'user1'). 1478601507: New connection from 127.0.0.1 on port 8883. We can see that the broker extracted the username from the certificate property CN. If we don’t use the use_identity_as_username as true we need to provide the username and password and the client certificate. In this case, the certificate is validated, and the user used to logon might not be the same as the one defined on the CN certificate property. So without this directive we either need to allow anonymous logon again or define user and passwords. With user and password authentication we can revoke access to an user, by deleting it from the password file or changing the password. But what about the authentication based on client certificates? As long the certificate is valid, the user can logon at will, since the broker will always accept it until the end of the certificate validation date. The solution for this is to revocate the client certificate so when it is used, the broker rejects it. For this functionality, most Certificate Authorities provide the revocation list by providing either by CRL (Certificate Revocation list) file, or by OSCP (Online Status Certificate Protocol), and the server checks the client certificate on this list before allowing access. Mosquitto broker only works with CRL files. The issue now is that the script that we are using for generating certificates doesn’t generate CRLs, and so we can’t revocate certificates by using this script. We can do it by hand, but that wouldn’t make our life much easier, since revocating certificates means that the CA server must now track all certificates and their status. One possible solution is to use scripts that allow to create (a not very secure) CA: easy-ca. These scripts will replace the genCA.sh script and allow the revocation of certificates. I’m omitting a lot of output that these scripts do, namely asking for the Organization name, CA passwords and so on. Then at the CA directory we created, we can now create our broker certificate and user certificate. Make sure that the names make sense. We now have all the needed files for setting up our broker with support for CRL. And restarting the broker we have the new certificates in place. You are about to revoke this certificate with reason 'keyCompromise'. 1478625909: Socket error on client , disconnecting. 1478625910: New connection from 127.0.0.1 on port 8883. With the low cost of the esp8266 chip and boards, it is now easy and affordable to add connectivity to almost anything that we can think of. Still if we build an Internet of Things device by enabling it with the esp8266 chip to connect to the internet, or other networks, what we can do with the data that we gather? Basically we do what we do with any data that we get, store it, process it and show it, and that’s what we are going to see on this post. MQTT Broker Mosca: (http://www.mosca.io/) There are several MQTT brokers available, but this one runs on Node-Js and so is platform agnostic, and runs where Node-Js runs. Also it has websocket support out of the box, which allows to use the Freboard.io dashboard in a straight foward way. Freeboard.io Dashboard: (http://freeboard.io/) Is a great dashboard and freely available at the project GitHub page (https://github.com/Freeboard/freeboard). It allows to design and store several dashboards with some cool widgets. First of all make sure that you have node and npm (the node package manager) installed on your distribution. You can see that with the commands node -v and npm -v for checking out their versions. In my case, and for now, it’s version v0.10.33 for nodejs and 1.4.28 for npm. First I’ve created a directory named IoTServer where I’ll keep all software and configurations. Download the zip file from nodered GitHub page https://github.com/node-red/node-red or just clone the repository. I clone the repository, because it’s simpler in the future to update it with just git pull. First just make sure that you have the icu/libicu libraries installed. 24 Feb 11:35:59 - [warn] [rpi-gpio] Info : Ignoring Raspberry Pi specific node. We can now start designing our nodered workflows that receive data from the esp8266 via MQTT protocol or even by simple REST based HTTP protocol, process it and store the data payload, if any. For storing data into a database, we can use MongoDB, or mysql, for example, installing the needed modules. And we need to restart nodered. The mysql node should be available now in storage pallet. We can use several brokers, but since we already are running nodered on node-js, we will use Mosca. Both nodered and Mosca can provide a websocked based interface. This is of interest because we can use browser based websocket applications, like freeboard.io, to consume data from our IoT devices. If having trouble installing or using Mosca, we can use the latest Mosquitto version 1.4 that has websockets support. For that we need to make sure that cmake and uuid/uuid-dev are installed (For example: sudo apt-get install cmake uuid uuid-dev). 1424790588: Config loaded from /etc/mosquitto/mosquitto.conf. 1424790588: Opening ipv4 listen socket on port 1883. 1424790588: Opening ipv6 listen socket on port 1883. 1424790588: Opening websockets listen socket on port 9001. We are almost at the end of this long post. For our infrastructure we need now to install the dashboard that will allow us to see the data in the browser. And now freeboard is available at the url http://myserveraddres/iot. That’s it. We are finally ready. All infrastructure is done. We need now just to configure it. Access the freeboard.io dashboard, and select Datasources -> Add. From the dropdown box, we select the Paho MQTT provider. 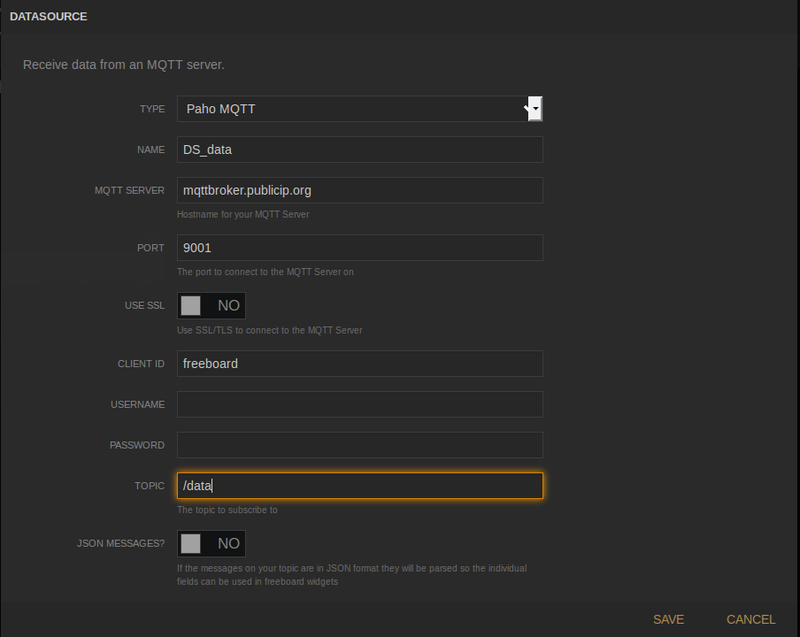 Change the MQTT server address to something that makes sense in your config. For Mosquitto with websockets enabled, the port is 9001, and for Mosca, the port is 3000, but of course this can change, depending of the configuration used. We can now add a Panel and a gauge to see data from the topic /data that we defined on the above datasource. So, Add Pane, and on the new Pane select the + (plus) to add a widget. In our case we will select Gauge. We fill out the required info and on the Value field we press Datasource, and select the newly previous created datasource named Data and because we are not using JSON for data, we just append .msg at the end. So something like datasource[“DS_data”].msg should be writen. We press Save, and that’s it. That’s it. It works fine with Mosquitto 1.4 with websockets enabled and with the Mosca MQTT broker. We should make our dashboard permanent and for doing so we need to save the dashboard locally as a JSON file, and move it to the server running the dashboard to the root directory of freeboard. Warning:The current freeboard.io project at Github (as of 12/2015) has problems saving dashboards when using Firefox. For saving dashboards use Chrome/Chromium.